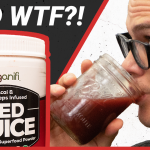 Home » Organifi Red Juice Review – Can It Really Boost Metabolism? Organifi Red Juice Review – Can It Really Boost Metabolism? Organifi is a California-based company founded by Drew Canole that’s best known for their Green Juice, a green superfood powder that has a big emphasis on the adaptogen ashwagandha, which could help the body to manage the effects of stress. These are pretty big claims and the product seems to have even greater aspirations than Green Juice. I decided to dig a little deeper and see how many of these claims were supported. Shop Organifi Red Juice here. There are 30 calories in a scoop and they all come from carbs: there are 7 grams of carbs, 1 gram of sugar, and 2.4 grams of fiber. There are just two micronutrients: there’s 5 milligrams of sodium (under 1 percent of the RDI) and 8,333 percent of the RDI of Vitamin B12. With products like these, the emphasis is usually on the ingredients. They’re split up into three proprietary blends, so we don’t know the exact weight of each of the ingredients here. Everything is organic. Antioxidant Berry Blend (2.1 grams): Pomegranate juice powder, cranberry powder, blueberry juice powder, raspberry powder, strawberry powder. Endurance Blend (3.05 grams): Beet root powder, cordyceps powder, reishi mushroom extract. Metabolic Boosting Blend (1.3 grams): Acai juice powder, rhodiola powder, Siberian ginseng powder. The ingredients also include artichoke inulin and some flavorings: natural berry acai flavor, malic acid, and monk fruit extract flavor. So what does all this do? When you look at their site, Organifi emphasizes three main benefits: anti-aging, nootropics, and metabolism boosting. But the marketing claims are a bit over the top, including language like “loaded with the precise antioxidants you need to PREVENT aging skin.” Maybe some effects of aging will be somewhat mitigated but aging isn’t being prevented. There’s a similar issue with the nootropics claim, which refers to a product’s ability to improve certain aspects of cognition. Are antioxidants associated with better memory? Yes, some studies have indeed concluded that! But Organifi goes as far to say that with Red Juice you’ll “never forget a friend’s name” and “remember where you put your keys.” Again, these claims promise a bit too much. There are also other ingredients linked to better cognition as well; cordyceps mushroom, for example, has been seen in some studies to boost well-being and lower fatigue. What about the metabolism boosting? They do link some studies that show certain ingredients resulting in a better metabolism. For example, it says it includes blueberries because it has phosphates, iron, and magnesium, micronutrients that aren’t listed on the nutrition label but Organifi claims make blueberries “raise your metabolism.” They link to a study that showed rats experiencing lower inflammation and obesity-related metabolic disturbances because they ate blueberries — but they had ten percent of their diet consisting of blueberries. This product has less than a gram of blueberries. That pattern repeats a lot when you look at the claims made and studies cited. It’s true that Siberian ginseng does have a few studies that link intake to lower body fat, but as is the case with all of these ingredients we don’t know the dosage used in Red Juice. Prices can change at any time for any reason, but right now you’re looking at between $55 and $70 for a tub of 30 servings If you get three bottles a month the cost drops by about 10 to 20 dollars per bottle but at the end of the day you’re looking about $2 to $2.50 per scoop. Most superfood powders cost roughly $1.50 per serving so this is a little pricy, but not outrageously so. 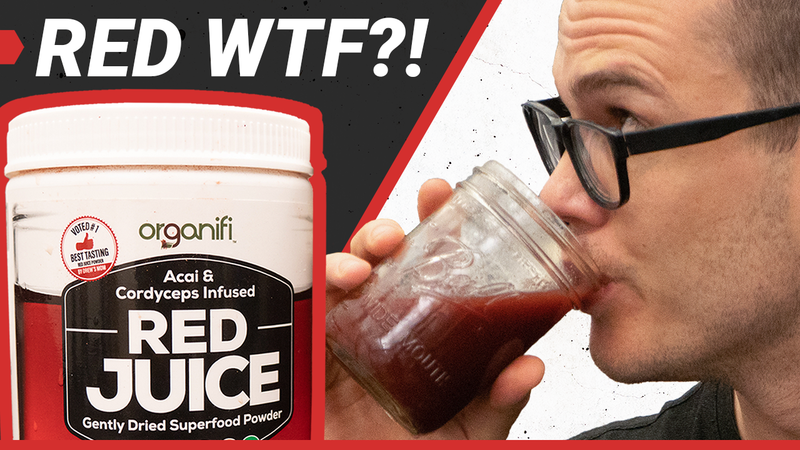 I’m always apprehensive when I try superfood powders, which have a well-deserved reputation for tasting like soil, but Red Juice tastes a lot like a berry juice cocktail. I was impressed. My main complaint with Red Juice is that it’s not very transparent. There are practically no vitamins listed on the label besides B12, no dosages of the ingredients, and the studies cited on their website don’t always correlate to the claims. With that said I do believe this product provides antioxidants and I think there’s a chance there are enough mushrooms to potentially improve some aspects of cognition. I just wish I could be a little more sure. I just had my first class of Red Juice. I thought it tasted awful. As bad as the final glasses of the pre-colonoscopy drink. I mixed one scoop with 8 oz of gold water and shook it up really good. Should I used less of the powder? Or, could I mix it with iced tea? Is this something I should just quickly drink down. Thank You. I’ve been looking forward to this fire a while.